The colder temps have arrived, and with that we have to put away our favorite colorful handbag. Sad I know! Time to take out the neutral, winter white and black handbags instead. But don't fear, a simple handbag is now far from ordinary! For the fun of it, this is 1 of 3 posts in my Affordable Winter Handbag Series! 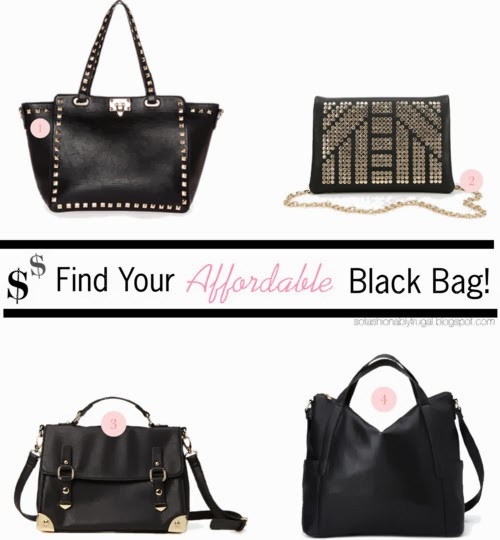 Black bags are a wonderful way to show your style. Pick through varieties of textures, details and embellishments to find a bag that really stands out! The above bags all have features that really make them shine. For example, the first from Daily Look has a great leather texture that makes it look very chic. Plus you get the studded details! My favorite however is the one by Urban Outfitters. The metal embellishments make it so luxe! Especially the dainty chain strap. Perfect for upcoming holiday outfits or even just a quick trip to the coffee shop.